NOTE: Before purchasing, check with your instructor to ensure you select the correct ISBN. Several versions of Pearson's Mastering products exist for each title, and registrations are not transferable. To register for and use Pearson's Mastering products, you may also need a Course ID, which your instructor will provide. If purchasing or renting from companies other than Pearson, the access codes for Pearson's Mastering products may not be included, may be incorrect, or may be previously redeemed. Check with the seller before completing your purchase. Contemporary Human Geographyis a beautifully crafted, modular springboard into essential human and cultural geography concepts, designed for the contemporary geography student. This brief, innovative text explores current human geography in the bold visual style that distinguishes Dorling Kindersley (DK) publications. Topics within each chapter are organized into modular, self-contained, two-page spreads. Together with the graphics, Rubenstein’s efficient writing presents information clearly without sacrificing the high-quality geography content essential to students and instructors. The Third Edition offers an updated cartography program, new pedagogical tools to help guide students, and the latest data and applications. MasteringGeography is an online homework, tutorial, and assessment program designed to work with Contemporary Human Geography to engage students and improve results. Interactive, self-paced coaching activities provide individualized coaching to keep students on track. With a wide range of activities available, students can actively learn, understand, and retain even the most difficult concepts. MasteringGeography is the leading online homework, tutorial, and assessment product designed to improve results by helping students quickly master geography concepts. Self-paced coaching activities feature immediate wrong-answer feedback and hints that emulate the office-hour experience. Mastering helps instructors maximize class time with easy-to-assign, customizable, and automatically graded assessments that motivate students to learn outside of class and arrive prepared for lecture or lab. NEW! Over 150 new Geography Videos from such sources as the BBC and Financial Times are now included, in addition to the videos from Television for the Environment’s Life and Earth Report in MasteringGeography. These Geography Video Activities help your students develop a sense of place as they explore a range of locations and topics related to human, cultural, regional, and environmental geography. NEW! Dynamic Study Modules personalize each student’s learning experience. Created to allow students to study on their own and be better prepared to achieve higher scores on their tests, this mobile app is available for iOS and Android devices. UPDATED! MapMaster™ Interactive Map Activities use enhanced critical thinking exercises toimprove students’ geographic literacy. MapMaster is a powerful interactive map tool inspired by GIS that includes layered thematic and place name interactive maps at world and regional scales for students to build their geographic literacy, data analysis, map reading, and spatial reasoning skills. UPDATED!Encounter Activities using Google Earth™ make Google Earth assignable and assessable. Pearson’s Encounter Activities provide rich, interactive explorations of geography concepts using the dynamic features of Google Earth. UPDATED! GeoTutors and Thinking Spatially & Data Analysis coaching activities present tutorials on the most challenging topics in geography, exploring critical topics with real world data and applications. Learning Management System (LMS) Integration provides seamless access to Mastering. We’ve made it easier to link from within your LMS to Mastering and provide solutions, regardless of your LMS platform. Learn more about LMS Integration. Mastering provides everything you need in an easy-to-use format. A rich and flexible set of pre-built courses and assignments get you started quickly. These assets can be used as is or customized to fit your specific teaching needs. The Calendar View on the course home page displays upcoming assignments and due dates, so you can easily stay organized. Mastering’s powerful gradebook records all scores for automatically graded assignments. Struggling students and challenging assignments are highlighted in red, giving you an at-a-glance view of potential hurdles in the course. Mastering’s diagnostics and insights provide unique insight into class and student performance. With a single click, you can view charts that summarize the most difficult problems, identify vulnerable students, and indicate grade distribution and score improvement over the duration of the course. Using data gathered from all of the students using the program, Mastering offers wrong-answer feedback that is specific to each student. Rather than simply providing feedback of the “right/wrong/try again” variety, Mastering guides students towards the correct final answer without giving the answer away. Mastering provides two types of hints that help students work through, and ultimately solve, problems. Declarative hints provide advice on how to approach the problem, guiding students to the final answer. Socratic hints break a problem down into smaller sub-problems, which make it easier for students to complete the original problem. Mastering’s dynamic, best-in-class content is continually being improved based on data generated through classroom use, resulting in content that is driven by the performance of actual students. The unique DK-style format provides unparalleled clarity while adding excitement to tried-and-true, first-rate geographic analysis. The book's brief format features carefully selected topics that will provide a springboard to each individual professor’s human geography course. A modern integration of precise maps, carefully crafted prose, informational illustrations, and vivid photographs propels students off the page and into a real-world visual and intellectual understanding of the principles outlined in the text. UPDATED! All images, photos, and figures have been carefully chosen to complement and expand upon the content, providing a balanced presentation of visual imagery and text. UPDATED! Maps are updated, restyled, and modernized to improve overall effectiveness and impact. Real institutions, businesses, and people add relevancy to photographic references, instilling in students a sense of place and providing a personal connection to facts, concepts, and illustrations presented on the page. UPDATED! The latest science, statistics, and associated imagery are used in the Third Edition, including updates from the 2010 U.S. Census and 2014 Population Reference Bureau World Population Data. The book’s modular organization consists of chapters made up of self-contained two-page spreads, a reliable presentation that gives the instructor flexibility when assigning material to students. UPDATED! To help readers more easily synthesize concepts and navigate the chapters, the module elements have been reorganized into a straightforward hierarchy. NEW! Debate It features present two sides of a complex topic, in a two-column pro vs. con format, to engage students in active debate and decision-making. Debate It can be used for homework, group work, or discussion sections. NEW! Observe and Interpret features areincluded throughout the modules to give students a more active learning experience–as they work through each module, they can stop and practice/apply their understanding. NEW! Research and Reflectfeatures connect students online to original data sources via QR links, where they examine data and respond to critical thinking questions. A structured learning path guides students through content that is both visually engaging and conceptually challenging. UPDATED! Redesigned Chapter Openers use both graphics and text to give readers a succinct preview of the entire chapter, including a spatial TOC that maps the locations discussed in the chapter. Every chapter opens with Key Questions, which are then used as the framework for each two-page module within the chapter. These Key Questions ask students to take a bigger picture approach to the concept. Students should be able to answer the Key Questions presented in each module after working through it. Quick Response (QR) Codes on the chapter openers enable students to use their smartphones to link from the book to various open source geography websites, providing easy and immediate access to original sources and up-to-date data. Each module also presents two unique Main Points that students should understand after reading the module. A summary of the Main Points of the chapter organized by the Key Questions. Thinking Geographically critical-thinking questions that give students a chance to practice higher order thinking. NEW! GeoVideo critical-thinking activity built around short videos in MasteringGeography from the BBC and Financial Times. UPDATED!MapMaster™ Interactive Mapping activities that give students a chance to use exciting GIS-inspired geospatial media to explore concepts, practice critical image and data analysis, and extend chapter learning. UPDATED! Explore activities have students explore features of the virtual globe with Google Earth™. Chapter Key Terms with definitions that help students review. Looking Ahead features that preview chapter material to highlight connections between chapters. UPDATED! International coverage goes beyond the western tradition to help students see connections at the international and global level. UPDATED! Gender, nationality, and ethnicity themes are presented clearly with the most current and diverse coverage. UPDATED! Medical and health geography topics, including the challenges and threats to access, are now emphasized throughout the book. The population chapter is updated with new demographic data, including the world population at 7 billion vs. declining birth rates. UPDATED! The food and agriculture chapter covers some of the most critical issues facing the 21st century: the scarcity of food and water resources and production in a planet with over 7 billion people. UPDATED! Folk and popular culture phenomena–from professional sports, to music, to social networking–are integrated throughout the book to keep students engaged as they read. UPDATED! Political geography sections cover the 2012 U.S. elections, critical Supreme Court decisions, the momentum of various population uprisings, the deaths of various dictators and terrorists through 2014, and the resultant implications for U.S. and international political geography. James M. Rubenstein received his Ph.D. from Johns Hopkins University in 1975. He was Professor of Geography at Miami University, Oxford, Ohio, where he taught urban and human geography, and where he helped develop the new Sustainability co-major in the Institute for the Environment & Sustainability. 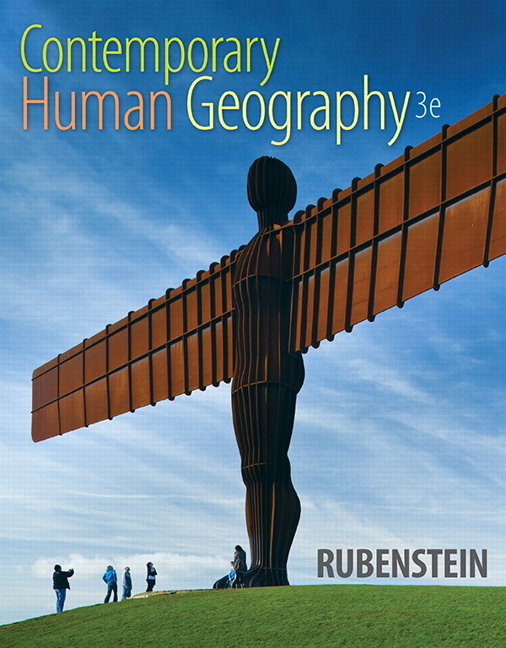 He is also the author of Pearson’s The Cultural Landscape and Introduction to Contemporary Geography. He is often invited to give talks and presentations at colleges, high schools, and professional meetings. Rubenstein works as a regional consultant for the Chicago Federal Reserve Bank and he conducts research in the automotive industry. He is often interviewed by the media on automotive and economic issues, and has published three books on the subject: The Changing U.S. Auto Industry: A Geographical Analysis (Routledge); Making and Selling Cars: Innovation and Change in the U.S. Auto Industry (The Johns Hopkins University Press); and Who Really Made Your Car? Restructuring and Geographic Change in the Auto Industry (W.E. Upjohn Institute, with Thomas Klier). He is a semi-amateur, semi-professional painter, and displays his work at galleries in Maryland and Ohio.